From cell phones to automobiles, the microelectronics industry has become ubiquitous in all facets of our daily lives. Device lifetime has always been a concern for this industry, and finding ways to extend it is a key area of research. To improve device lifetime, adhesives are frequently utilized and they must be researched in order to improve them. Typically, the polymer/adhesive buried interfaces are split apart and investigated ex situ, but, by using SFG spectroscopy we can investigate these interfaces in situ and noninvasively. In this project, various polymers and adhesives are investigated to determine their buried interfacial structure. We also perform plasma treatment, hygrothermal aging, and add silane adhesion promoters to determine what effect they have on the interfacial structure. In addition to spectroscopic probing, lap shear analysis is also performed, to correlate the macroscopic properties with the interfacial structure. 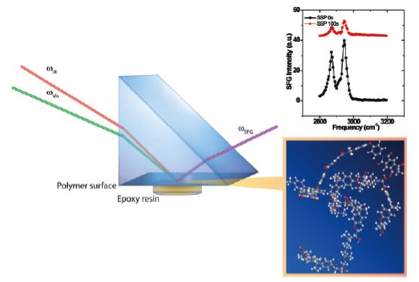 By investigating polymer/adhesive interfaces with SFG spectroscopy we gain a better understanding of the fundamental interactions that are relevant in adhesion and how to improve these systems. PECVD deposited SiCOH materials are widely used as low-k materials in interconnect structures in high performance integrated circuits to improve resistance-capacitance delay, minimize crosstalk noise, enhance signal transmission and reduce power dissipation. However, a fundamental understanding on the detailed correlations between the molecular structures of surfaces and buried interfaces of interconnects and interconnect reliability have not been directly elucidated, due to the lack of in situ characterization tools to non-destructively study buried interfaces. We successfully developed SFG into a powerful tool to elucidate the surface and buried interface structures of low-k SiCOH films at the molecular level in situ. Model spin-coating low-k films and commercial low-k samples prepared by PECVD from IBM and Intel have been investigated, validating our methodology. Organic semiconducting materials have generated strong interest due to their low fabrication cost, tunable charge transport property, and ability to facilitate large-area device fabrication. They have many important applications, including organic field effect transistors (OFETs), organic photovoltaics (OPVs), and organic light emitting diodes (OLEDs). In such applications, their interfacial structures play important roles in determining their interfacial properties, impacting the performance of the entire device. We have applied SFG to examine the molecular structures of polythiophenes at various buried interfaces in situ. 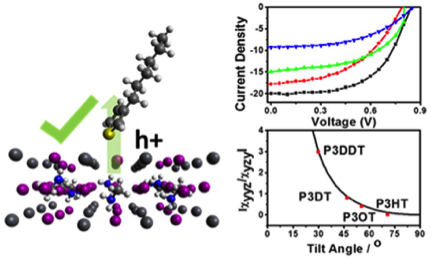 We found that many factors such as solvent, substrate hydrophobicity, and side chain composition can affect polythiophene buried interfacial structure. For example, the interfacial orientation of the thiophene ring has a direct relation with the perovskite solar cell conversion efficiency. Polymers that have the ability to eliminate the adhesion or growth of biological organisms onto surfaces are widely used as biomedical materials and marine antifouling coatings. For antifouling materials, it is widely believed that for hydrophilic polymers and some amphiphilic polymers, strong surface hydration is a key contributor to their antifouling property and different molecular mechanisms have been proposed to interpret their antifouling performance. A highly hydrated polymer surface can bind water molecules so strongly that other molecules and organisms cannot replace these interfacial water molecules for fouling to occur. It is difficult to probe solid/liquid interfaces using traditional surface sensitive analytical tools, because many such tools require high vacuum to operate. Using SFG, we examined surface restructuring behaviors of various polymers in water in situ. In addition, we studied interfacial water structures at the polymer/water interface. We have studied many antifouling polymers, including silicone, zwitterionic polymers, mixed charged polymers, polyethylene glycols, polypeptoids, etc. We also studied molecular interactions between various polymers and mussel adhesives a well as barnacle glues.